Inflammation is a vital part of the body’s immune response, it is the body’s attempt to heal itself after an injury, to defend itself against foreign invaders, such as viruses and bacteria, and to repair damaged tissue. Acute inflammation is often known as ‘good ‘inflammation because it is the body’s response to an injury and its attempt to heal it. However we cannot say that chronic inflammation is ‘bad’ because any inflammation is the body’s natural response to a problem, so it makes us aware of issues that we might not otherwise acknowledge. 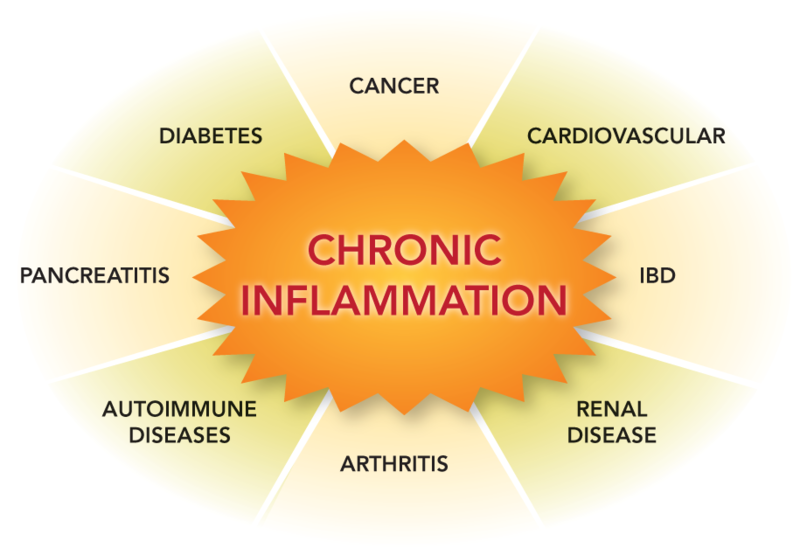 Chronic inflammation happens when the body sends an inflammatory response to a perceived internal threat that does not require an inflammatory response. The white blood cells swarm, but have nothing to do and nowhere to go, and they sometimes eventually start attacking internal organs or other necessary tissues and cells. Other times, the threat is real but we do not feel it or the inflammatory response, and the inflammation can persist. 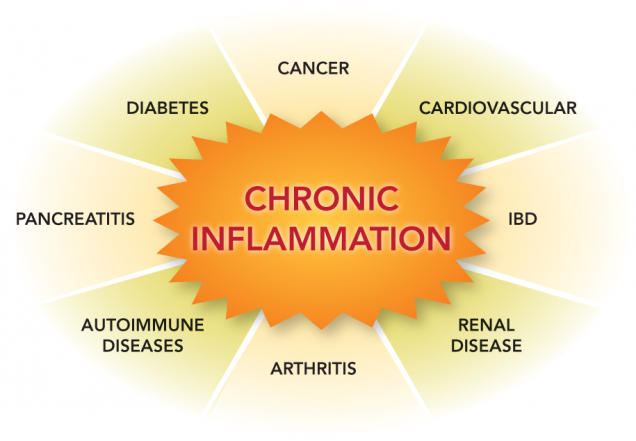 Persistent inflammation has been linked to many problems and has been found to be the cause of all chronic disease, and underlies all major degenerative disease, including cardiovascular disease, diabetes, asthma, arthritis and even cancer. Inflammation causes infertility, and schizophrenia and psychosis are inflammatory processes. Inflammation may be the single most important mechanism driving the obesity epidemic, but why is there so much inflammation? The answer to that question is ‘lifestyle and environment‘. It is often associated with environmental or habitual factors, such as pollution or poor diet. Everyone is so busy and stressed in their daily life that they haven’t got time to cook from scratch, so they shop in the supermarket where all the food is processed, and packaged and nutritionally bankrupt. It is grown in mineral deficient earth, harvested before it has ripened properly, forced to grow in unnatural toxic environments and sprayed with chemicals to protect it from pests. These chemicals are hazardous to the human body, our bodies respond with inflammation, and yet we expect them to function properly. In the post war years families supplemented their diet significantly with home grown foods that were indigenous to the country they lived in. Food was wholesome and tasted good, as food should, dairy products and meat were a far greater rarity than they are now. In direct correlation to this, disease was significantly lower than it is now. Could there be a link? Today 1 in 3 people will be diagnosed with cancer, 68% of the population of modern Britain is either diabetic or pre diabetic. Parkinson’s disease, Chronic fatigue syndrome, Alzheimer’s and countless other health problems are being faced by virtually every family on the planet, this is not getting better it is getting worse! I always like the analogy of the workings of a car. If you put petrol into a diesel car it won’t get you very far, in fact you won’t get anywhere, I know because I have done it! It is time now to take your health and wellbeing into you own hands and start to eat a good diet, drink good water, get plenty of sleep, exercise and have a positive mental attitude! So what is a ‘good’ diet? Well it certainly isn’t the Standard American Diet which is also the standard English diet, full of sugar, refined foods, transfatty acids, high fructose corn syrup, GMO, dairy polluted with antibiotics and bovine growth hormone. These fast foods lead to poor digestion, inflammation and obesity. Trans fats are artificial and highly inflammatory, they destroy cell membranes and therefore cell communication. They compromise detoxification of cells and increase heart disease, depression, infertility, diabetes, Alzheimer’s disease and arthritis. Start eating a diet of fresh meat, fish, vegetables and fruit, organic where possible. Cut out all sugar, processed foods, transfats and cook your food from scratch. There are so many recipe books and cooking shows on television these days to show you great cooking and yet people still get their ‘ready meals’ from the supermarket! Eat good oils, such as avocado oil, coconut oil and oily fish, but be warned because we store our toxins, pesticides, synthetic hormones and heavy metals in our fat cells, and you may have headaches when you are clearing them from your body. So, what else can we do to help the inflammation and improve our nutrition? There are some amazing herbs and spices that can help and one nutritional product that has been proved to reduce oxidation in the body by 40% in 30 days is Protandim. This is a synergistic combination of 5 herbs that work on a pathway in the cells called the Nrf2 pathway which upregulates the antioxidant genes, especially those that make glutathione, one of the most important antioxidants in the body, and downregulates the inflammatory genes such as nuclear factor kappa B. Milk thistle has antioxidant and anti-inflammatory properties. It is commonly used to detoxify the body, especially the liver, and promotes healthy digestive function by helping with enzyme formation, increasing bile production, decreasing inflammation and soothing the mucous membranes throughout the body. 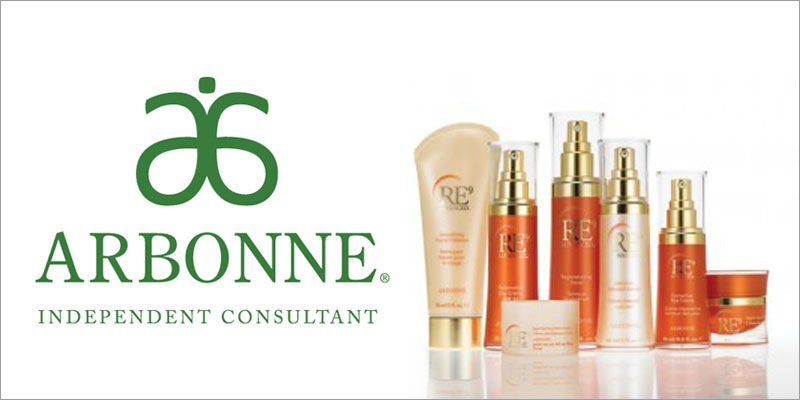 It works by drawing toxins out of the body and is a powerful antioxidant, fighting free radical damage and slowing the ageing process. It does this because it contains high levels of lipopholic extracts from the seeds of the plant which act as antioxidants. The biggest benefit of milk thistle is that it preserves glutathione, the most important antioxidant in the body, by improving the liver detox functions. Turmeric is arguably the most powerful herb on the planet at fighting and potentially reversing disease. The main healing compound in Turmeric is curcumin, which has the ability to control inflammation, some say better than anti-inflammatory drugs such as ibuprofen and aspirin and without the side effects of internal bleeding and haemorrhage. That must surely be good! Becopa is a fantastic antioxidant. It is a powerful herb for memory and combating stress. It also acts as an adaptogen helping the body adapt to new and stressful situations. It promotes liver health and antioxidant activity in the kidneys. Green tea is another antioxidant, and it is the leaves of green tea that haven’t been fermented that are used in Protandim because they have the highest levels of antioxidants. There are studies that have found a great number of health benefits from green tea especially as it relates to anti ageing conditions such as Alzheimer’s, bone health and eye diseases. Black pepper contains piperine that has the ability to enhance the digestive system and protect us against oxidative stress. It is also a good pain reliever, lowers cholesterol, detoxes the body and enhances circulation. Peperine is a strong antioxidant and has been shown to suppress human cancer cell proliferation. The seed of any fruit is where the nutrition is and there is more in the seed shell than in the rest of the seed. It is the treasure chest of nutrients! The shell is nutrient dense and the seed is on a mission to reproduce so it is persistent and resilient. We eat the seeds and chewing breaks them down to amino acids, simple sugars and essential fatty acids that are absorbable and bioavailable and they are able to go in and repair the damaged tissue, not just suppress the damage. The seeds in Soul are synergistic and have overlapping benefits such as anti-cancer, anti-inflammatory and also act as an analgesic. Black cumin seeds encourage apoptopic cell death by way of the P53- dependent mechanism that is a cancer suppressor gene. Black raspberry seed is a powerful beneficial agent against cervical cancer, breast cancer, oesophageal cancer, oral cancer, colon cancer and it works as an anti-inflammatory in ulcerative colitis. Chardonnay grape seed may prevent the growth of breast, colon, stomach and lung cancers as seen in test tubes. It is Anti metastatic. Chardonnay seed may also help to prevent damage to liver cells caused by medication, and helps to reduce obesity development. It contains resveratrol which is anticancer, helps in diabetes and is anti cholesterol helping with triglycerides. D-ribose is a 5 carbon sugar produced by the body for energy. It boosts muscle energy, improves symptoms of chronic fatigue, fibromyalgia, and coronary artery disease, prevents symptoms of cramping, pain and stiffness, and it lowers blood sugar in diabetes. 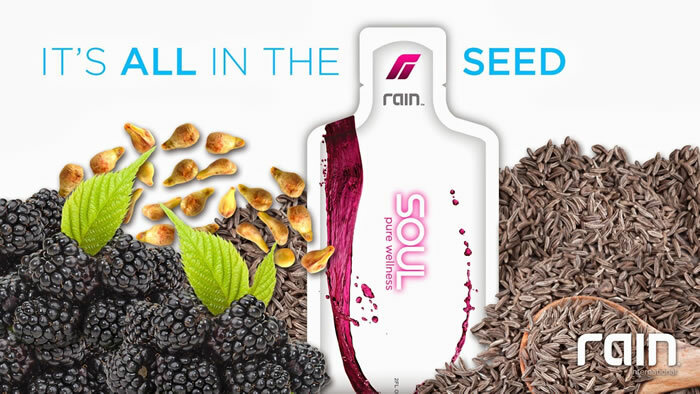 Soul has been found to be the most powerful scavenger of free radicals with an ORAC – oxygen radical absorbance capacity – of 2675. Another wonderful natural anti-inflammatory is Boswellia better known as frankincense. This is a tree that grows in India and North Africa and the resin is used as a botanical medicine. It is rich in boswellic acids that are powerful natural anti-inflammatories and work by blocking an enzyme called 5-lypoxygenase. This is part of the inflammatory mechanism that conventional medicines such as aspirin, ibuprofen and other anti-inflammatory drugs do not address. In the Nutrabiotic supplement that I am talking about, boswellia has been combined with Turmeric, glucosamine HCL, chondroitin, vitamin C and hyaluronic acid to create a specially formulated supplement to help joint pain, mobility, cartilage and bone health. In my opinion it is essential for everyone to take a natural anti-inflammatory supplement to help in their daily living. They help the body to do its work and they support optimal life processes. For further information please call 01462 893586.